Human space flight is an awesome part of living in the future. But why does it still seem so abstract? There are people in space right now! Did you know that? Do you know how many there are? ISS-Notify is a simple attempt at making our space program more real. Many times a day the international space station passes overhead unnoticed. Often it happens during the day when it's too bright to see the tiny dot in the sky. So this light will pulse and shine whenever the station is overhead -- making the invisible visible. This started as a simple weekend project because I thought it would be cool. I finished it in only 4 days! The response has been overwhelming. Everyone says "I want one"! I've heard from space geeks, teachers, NASA employees, and just about everyone in between. 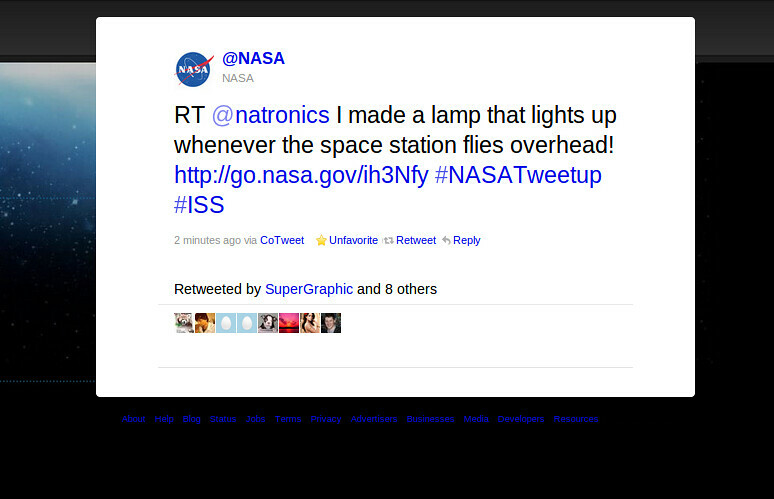 I've gotten coverage from Adafriut Industries, Hack a day, Bad Astronomy and even a retweet by @NASA! I'm going to use the money I raise to design and build a nicer version. Then I'm going to make as many as I can and sell them to other people who want to be in the know when it comes to space. Part of the funds will also go towards a website where I can sell them and host an API for anyone to use. Enough PCBs for the first production run. All the electronics to go on the boards. Enough plastic for the enclosure and time on a milling machine. Laser etch or milling services for the plexiglass ISS logo. The first three things can get expensive quickly. Backing this project takes the idea and multiplies it! I don't claim to be the first (or the last) person with this idea. In fact there are similar things out there. But they are expensive, and lack a simple, obvious meaning. Still, I don't want to make this a one trick pony. I'm going to release the design as an open source, open hardware project. I hope many people will be inspired by the project and will be inspired to make their own versions and track other things besides the space station. The limit should only be imagination!